I am convinced that reading the news is worse than not reading anything at all. There is no proof that it makes us wiser, better decision makers, better informed, better citizens; nothing — if anything, entirely the opposite. 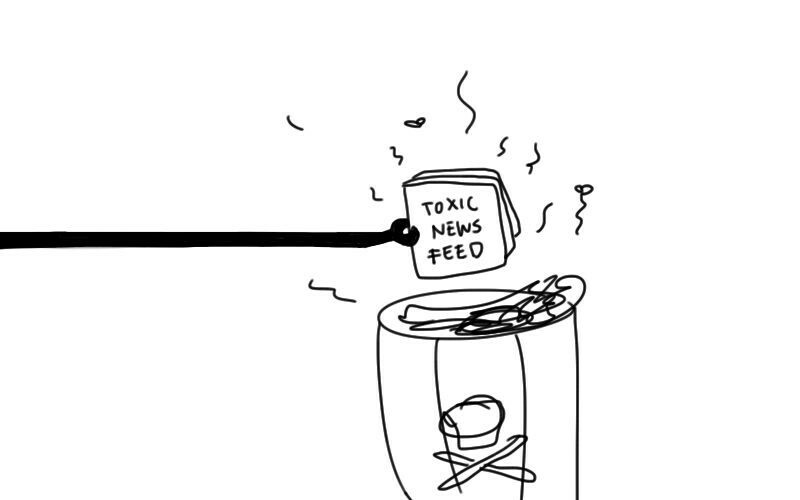 If you are anything like me, you’ve already stopped consuming news without even making a conscious decision about it. Maybe you felt the optimism being sucked out of you with every news bit and just stayed away or maybe without even noticing it, you found something better to do with your time and started replacing it. Or maybe you’ve never been a news person. Whatever the reason — I bet you don’t miss it at all and you’ve probably realised you don’t really need it. I wanted to write about this topic for some time now. Largely, because I got frustrated with that guy who thinks he is very cultured just because he reads the newspaper and knows what is going on in the world. And with that girl who knows everything about every celebrity and is very surprised to hear I don’t know about the leaked photos of Jenniffer Lawrence. But mostly, because I’ve benefited from it. 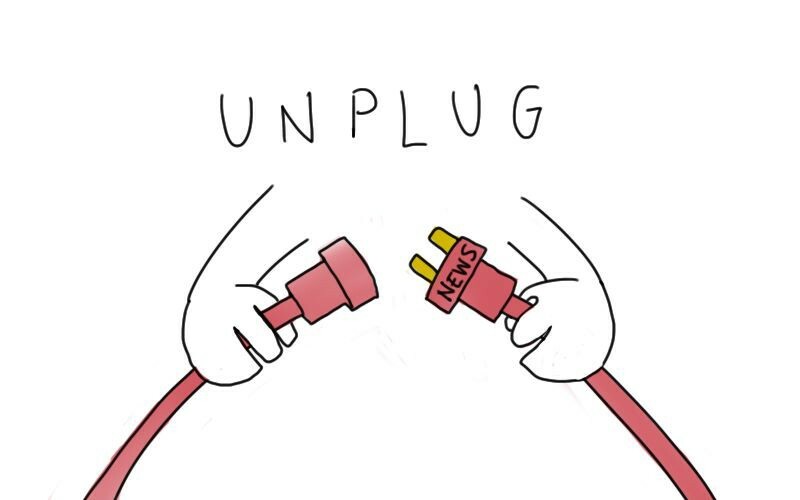 Since I unplugged from the news I feel more in control of my attention (I decide what thoughts I want wandering in my head), I have better reading habits (I seek and enjoy long, slow, thought-provoking reads), I have more time to gain meaningful insights elsewhere, and I’m definitely more optimistic. So I decided to do some research about it and was blown away to find more than enough reasons to back up my gut instinct. I expected to find arguments on it being irrelevant, misleading, manipulative and time-costly — but toxic for our body? alters our brain structure? creativity killer? increases cognitive errors and inhibits thinking? Now those are significant statements. Rolf Dobelli describes that unlike the limited attention we have to spend on long, deep, intelligent, slow and quiet content (which is actually important and requires thinking), our brains are wired to pay attention to the flashy, visible, large, scandalous, loud, graphic, dramatic and the story-formatted. 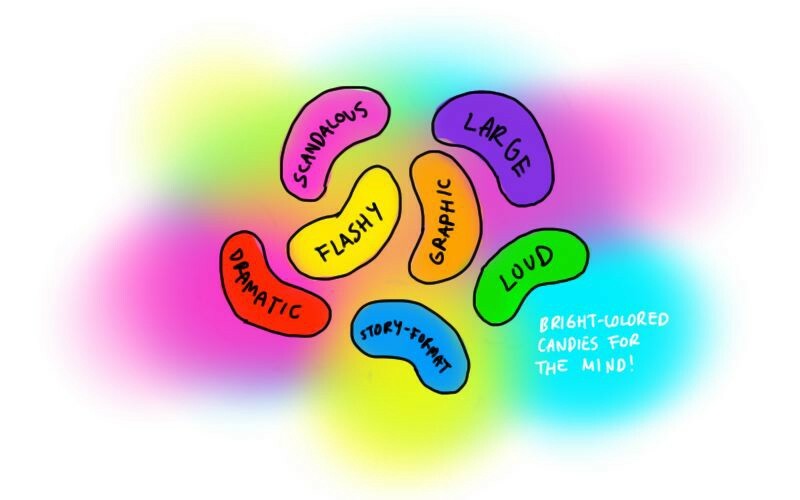 This is the reason we can swallow limitless quantities of news flashes, like bright-colored candies for the mind. And it’s not only the news media, these attention-grabbing techniques are almost everywhere, from government propaganda to corporate marketing. We see it all the time on facebook and twitter, each post screaming to get our attention, not so much asking but really tempting us for a click. “Information is no longer a scarce commodity. But attention is. In an era of paid-by-the-piece articles, of revenue-generating clicks, where luring headlines are more important than the actual content and where everybody can be a “journalist”, we should be careful about what we consume and we should specially be aware of the negative effects it has on ourselves and our society. Today we know that the adult brain remains neuroplastic, this means it has the amazing ability to adapt and quite literally change its structure and functions as a result of experiences, environments and behaviours. So it is concerning that we are spending so much time on a daily basis, skimming through pictures, videos, headlines and text for relevant keywords; scrolling, clicking, linking. With so much information, our brain has to form shortcuts to deal with the overload and the distractions, because on top of that, we consume news while multitasking. We read the newspaper while having breakfast, we listen to the news while driving and thinking about our day ahead, we watch news bits on tv while scanning through the channels, we scroll through our twitter timeline during work. We are quite simply teaching our brain to overlook the restrained and the quiet, to do these tasks with half our focus. News disperses our concentration and thins our comprehension and the more we consume it, the more we reinforce this habit. And as bad as that sounds, I don’t even think it’s the main thing we should worry about. For me, it’s simply the negativity. I truly believe we are underrating the effect that pessimistic content can have on the individual and collective consciousness of our world. James Clear said it best: When you’re overdosing on information that you can’t act on it’s easy to see why people say things like “it’s a messed up world out there” or “somebody needs to fix it.” Why make an effort when everything seems out of your control? Poverty, hunger, murders, war, terrorism, accidents, celebrity gossip. I don’t need to know this stuff and you don’t either. I know, you might be thinking that news is necessary because it keeps us informed about the world, but first ask yourself these questions. Does it really improve your life in any way? Does it affect you personally? Your family, your businesses or your career? Is it a true representation of our world? Does it encourage thinking? Does it encourage acting? Think about it. In the last year, has any piece of news changed your life? In a way that if you hadn’t read it, your personal or professional life would have be different? Let’s say you can remember that one article that was essential to your life. How many did you have to go through to stumble upon it? In a year, maybe hundreds? Thousands? Those are simply not good odds. And don’t you think that if something in the news is really important to your life — personally or professionally — you’ll hear about it from a co-worker, a friend or a family member? We should look for it, we should talk about it and we should share it. 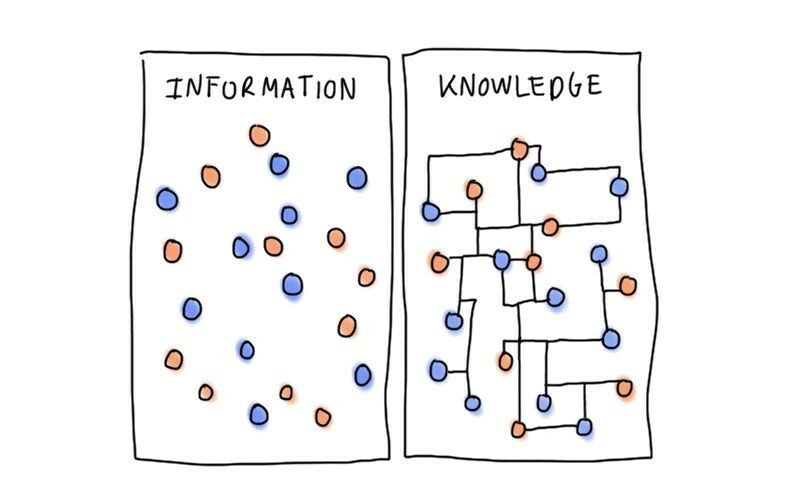 Information is only important if it’s helping us create, build, share or experience something wonderful. The world doesn’t need passive people to be informed, it needs active people to be knowledgable. So dive deep in subjects that you are passionate about. Think of the solution, not the problem. If your mind is filled only with thoughts of how you can die and what can go wrong, then you can’t think of how to live and what can go right. If you want to know about a problem, let it be because you are looking for a solution. Every problem is complex, and the only way to understand it is by diving into books and long journal articles. Go for problems you can have an influence on. Read books, magazines, complex articles, TedTalks, inspiring videos and podcasts. Don’t be afraid of not being up-to-date on the latest headlines. Those are just easy and superficial conversation starters. Be brave enough to talk about things that matter and start meaningful conversations. Make a conscious choice about what you consume. We need more hard-core journalists digging into meaningful stories, but we are not going to get there by sharing irrelevant content on facebook. We need people who appreciate thought-provoking content. Let your click, your time, your attention, your dollar be your support for great content. Thank you to Rolf Dobelli. His essay Avoid News, towards a healthy news diet inspired me to write this piece. Highly recommendable read.